OUTNUMBERED, a brief history of imposture is an audiovisual installation that examines the strategies used in making documentaries, Fact Fiction novels and popular scientific equivalents. Jasper Rigole examines concepts such as authenticity and objectivity by taking on a quasi - encyclopedic approach to his subject matter and presenting it with pseudo-scientific precision. The result is an apparently detailed study of the history of falsification. 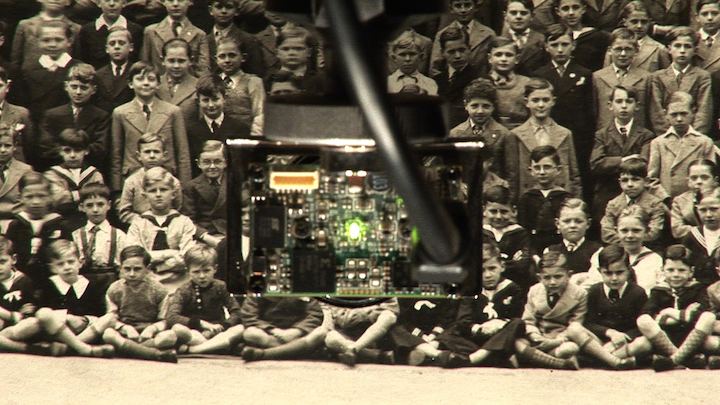 The video projection in the first part of the installation shows a camera moving over an old school photograph, using the pan-and-scan effect. 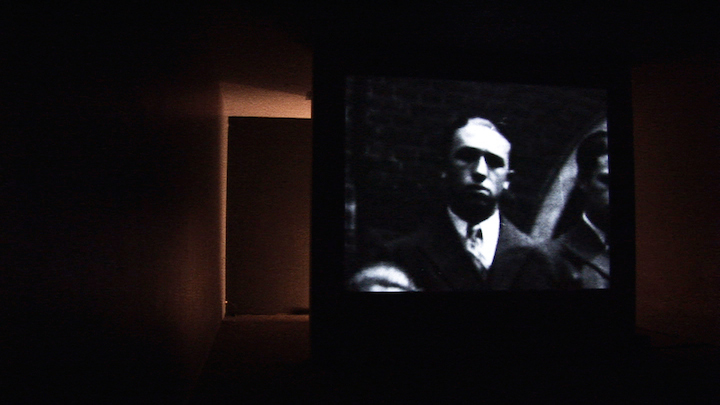 This technique is frequently used in documentary films to animate still archival footage. As the camera moves from one face to another, a voice explains who these students are and what their mutual relation is. According to the narration, the boys depicted are historical figures, some well known and others more obscure. They all seem to have a link to imposture. 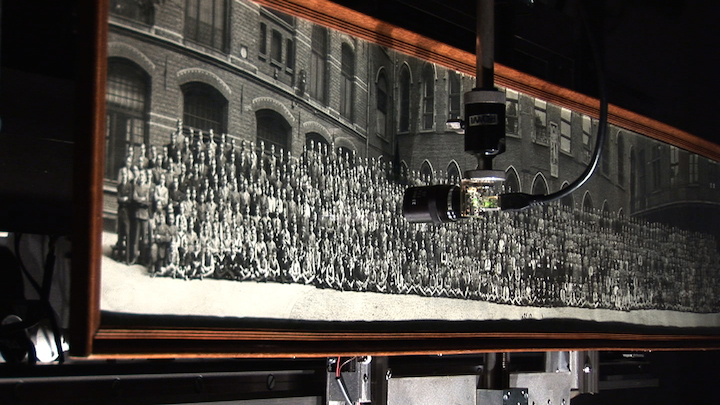 In the second part of the installation, it becomes evident that the first image is live and generated by a machine on which a panoramic school photograph for 1936 is hung. 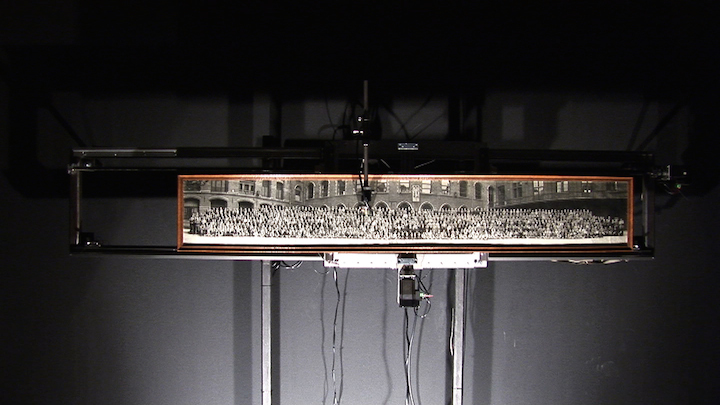 The machine is an inversion of the traditional rostrum camera. Instead of the camera moving above the photograph, the photograph moves in front of the camera. The whole system, its movement as well as its narration, is controlled by a computer that runs through a complex database which includes the names and biographies of 888 figures. Each biography is provided with metadata referring to different categories, such as occupation, specialities, peculiarities and so on. By detecting similarities in this metadata, the computer is able to link related biographies and generate a plausible story. This perpetual narrative follows an aleatoric system that allows for an infinite number of changes to occur. As the computer does not take all the categories into account and sometimes uses irrelevant information, it will often make mistakes and broadcast historically incorrect data. But because analogies in the successive biographies occur and the transitions seem logical, these mistakes can be seen as possible histories.